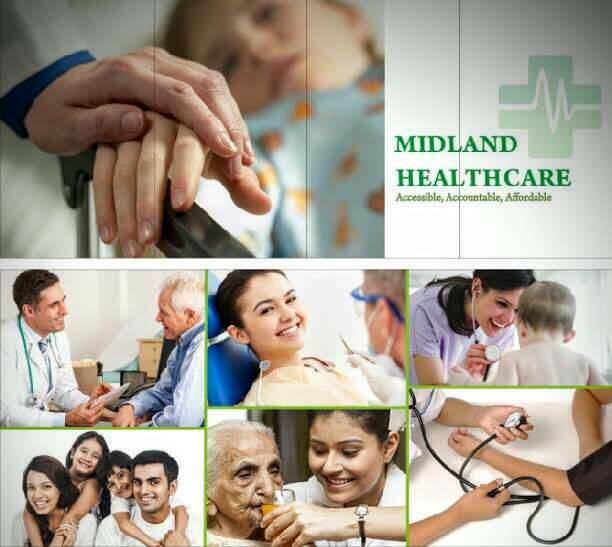 Midland Healthcare & Research Center is a leading integrated healthcare center in Lucknow. The service’s primary comprises of hospital, diagnostics and day care specialty facilities. The multi-specialty hospital Lucknow is ISO 9001-2000 certified unit known to provide accessible, accountable and affordable health care services to all sections of the society. As a responsible corporate citizen, we at Midland take the spirit of leadership well beyond business and have embraced the responsibility of keeping our citizen healthy. We appropriately support the patients facing difficult financial circumstances and treat everyone in our diverse community with respect and dignity. To provide quality health care and services at an affordable price for the prevention, diagnosis, and treatment of various illness. To attract and support specialists and other healthcare professionals to achieve the highest character and greatest skill. To support research & development into the causes and treatment of human illness and to educate health professionals to advance knowledge in the Healthcare Sector. To strive effortlessly with compassion and innovation for progressive care. To serve all classes of the society with sincerity and integrity. Patients and families have placed their lives and health in our hands. Our culture of caring will be unmistakable in every personal interaction as we treat individuals, families, and colleagues with compassion, honesty, and openness. We believe that maintaining the highest safety standards is critical to delivering high-quality care and that a safe workplace protects us all. By working together across disciplines and proactively supporting each other and operate as one team, we will create a unified, integrated approach to care. We will continue to respect and value people at all levels with different opinions, experiences, and backgrounds. Adopt a ‘can-do’ attitude. We will anticipate the challenges tomorrow may bring and develop new and innovative ways to inspire healthier communities. We started our journey in 1990 as Aditya Clinic with an aim to provide OPD facilities to our patients. It was the first and only tertiary care center for Respiratory, Sleep and Pulmonary Rehabilitation Center in the entire region. Since then, we have now grown up to be a 100+ bedded multi-specialty healthcare Lucknow, offering complete healthcare solutions to people of all ages, from Neonates to adults. The cornerstones of Midland’s legacy lies in its unstinting focus on clinical excellence, affordable costs, technologically advanced equipment and a forward-looking approach towards training & research. For more than 28 years, our patient has trusted us for the best care.